Answer: Well at least your better half is off to a good start. I would suggest you go to our website at www.saggioaccounting.com and click on the About Us tab and then select the Document Library, there you will find a "New Client Package" which contains a great Tax Organizer. We also have some great links to assist you with putting together your records under our "Information Center" tab. You will find numerous guides for handling your particular industry. Since you say you have a shoebox of receipts, I assume you may have your own business. These returns can get very complicated and you need the services of a true professional to help reduce your potential tax exposure. You will want to start by totaling all of the income your received from your customers. This is your "Revenue" and this is where we will start the process. 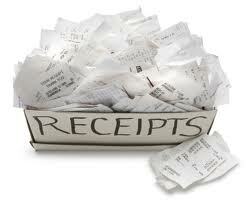 You will then need to sort your receipts by category and then total them up by category. These are your "Expenses." The difference between your Revenue and Expenses will by your net income. We will have some other ideas for you when you come in for an appointment, but you will want to also write down all of your "Business" mileage as well as any purchases of equipment, these are called "Assets" and they are treated a little different from expenses. Like I said, these returns get complicated quickly and you don't want to end up paying more than your fair share, unless you feel like making a donation to the Internal Revenue Service, but that's no fun! When you are ready contact Ralph V. Estep, Jr., of Saggio Accounting+PLUS at 302-659-6560 or visit our website at www.saggioaccounting.com and click on the "Book Now" icon to set-up an appointment. We are eager to start a relationship with you so let's hear from you soon.